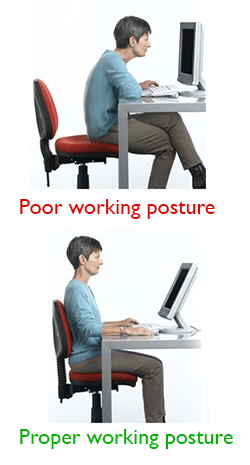 Improper posture can increase feelings of depression, zap your energy and cut off your circulation. If you work long hours at a desk, it’s important to follow some basic guidelines, both for your posture and for your health. Do not cross your legs for long times (this usually leads to temporary rises in blood pressure) and don’t stick them out in front of you. Resist the temptation of slouching and leaning forward. If you have the option, use a chair that is ergonomically designed for proper support, or try putting a small pillow between your lower back and the chair. For a quicker fix, you can use a folded or rolled-up towel. If your legs don’t reach all the way to the ground, consider getting a footrest (or asking for it to your employer). Adjust your chair and your position so that your arms are flexed. Aim for roughly a 75- to 90-degree angle at the elbows. Do not tilt your head up or down and keep your ears in line with your shoulders. 7. Get up and move every so often! This is extremely important: your body was not designed to sit all day. If you can’t leave often, try to incorporate mini-walks into your daily schedule, getting up every hour or so. Prefer the stairs to the lift/escalator and take breaks to stand up and walk to bathrooms that are farther away. Tagged back pain, chiropractic, chiropractor cork, posture.